Belonging to the Coastal Society makes you part of a vital community of donors shaping the future of our magnificent coast. This community supports protecting and restoring productive coastal waters and habitats. Help us engage coastal residents and visitors, including our youth and community leaders, in the stewardship of a healthy and prosperous coast. Coastal Society members provide critical dollars to put restoration projects on the ground, connect students with outdoor classrooms and mobilize advocates in the community. These donations provide the essential foundation for our work and provide the basis to pursue competitive grant funding. 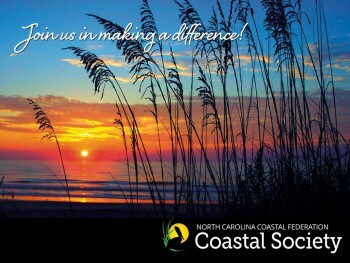 As a member of the Coastal Society, you’ll enjoy opportunities to visit some extraordinary places at the coast, meet with others who share your interest in the coast and engage with the North Carolina Coastal Federation in unique ways. Thank you to our current Coastal Society members! At whatever level you join the Coastal Society, you will also enjoy all traditional membership benefits, including Our Coast magazine, the Coastal Review Online, e-newsletters, unique volunteer opportunities and discounts on workshops and events. Donations minus the value of benefits are tax deductible. Fair market values of benefits are: Tidal Creek Advocate: $10; River Steward: $58; Sound Champion: $290. For more information or to join the Coastal Society, please contact Sarah King at 919-210-2617 or email her at sarahk@nccoast.org. We respect your privacy. The North Carolina Coastal Federation does not share, rent, loan, or sell your personal information. Donors may remain anonymous upon request.